Do you know that science can be fun? playing around with dorsal fins and flukes can end up in a fortunate match of a well known individual seen in different locations or at different times. Dolphins and whales are highly social mammals and their frequent physical interactions may leave permanent marks all over their bodies. Other accidents, like entanglements in fishing gears, when not lethal can also leave a visible memory. All these marks, especially if on dorsal fins and flukes are like finger prints and can help to tell apart single individuals. Being able to track individuals can, on a long term, give us information about its life history, site fidelity and movement patterns and the more individuals identified within a group the wider the picture we can get. Such information is not merely to satisfy the curiosity of scientists and marine mammals nerds, they are ultimately a valuable support for the conservation management of whales and dolphins populations. During daily whale watching tours, Terra Azul collects sightings and photographic data with the aim of contributing to the knowledge and conservation of cetaceans in the Azores. This is a long-term regional project started in 2009 and counting on the partnership of a University research centre and local whale watching companies distributed on different islands. Data are then entered in an online database, which is open to the public (www.monicet.net). The open-access characteristic of MONICET is considered crucial in that it allows the sharing of data among researchers interested in working for the wellbeing of populations, but also it contributes to create a link between the general public and science. 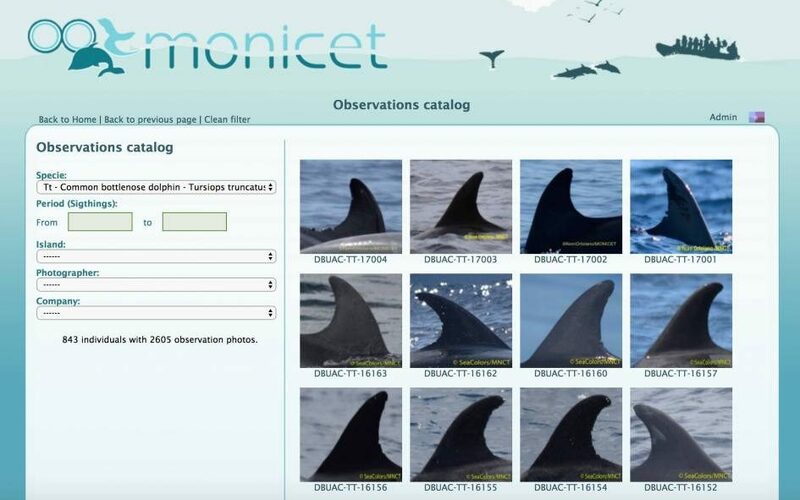 Citizens not only can have access to the database, but they can also contribute to it by sending their photos taken during regular whale watching tours. Few criteria, such as a right angle and a good resolution, are needed to make sure pictures are usable. 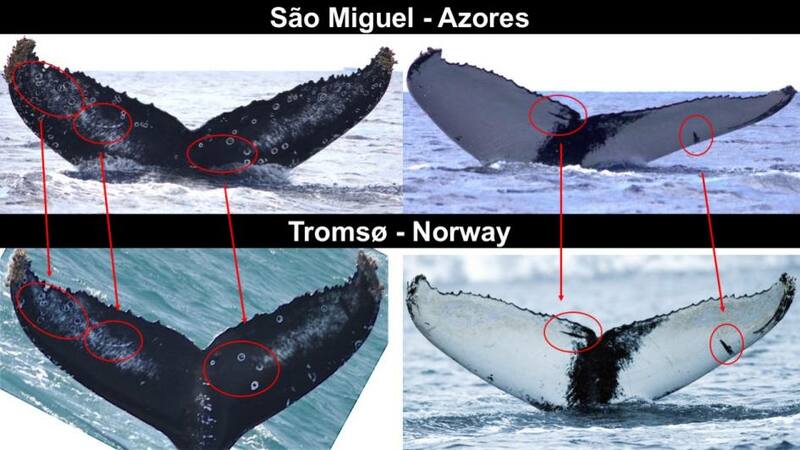 Matching can be quite exciting as it was when we find out that two humpback whales, which were seen in the Azores on the 17th of May of this year, have also been sighted off Tromsø, Norway, where they are included in the local photo-identification catalogue. One of the two individuals, the one with the darker fluke (see feature image) is also very well known in Cape Verde Islands where it has been seen during 2011, 2013 and 2017 seasons. So, if you want to have fun and want to contribute to research and the conservation of these fascinating creatures, fell free to visit the MONICET site and don’t forget to take lots of pictures when you join your next whale watching tour!